Christopher Fox, a pioneer settler of Galveston and one of the first bakers to arrive in the city, was born in Edenderry, Kings County, Ireland on March 9, 1811. Standing 5’10” tall with dark hair and bright eyes, Fox immigrated to New York in 1836, where he found work at Jonas Humbert’s bakery on the lower east side, near the infamous Five Points. A year later, he left for Texas, arriving in Galveston during the summer of 1837. That fall, a rival baker named Andrew Baldinger moved to Galveston and the two men raced to see who would bake the first, commercial loaf of bread on the island. In a wise move, Fox hired the city’s only brick mason to construct his baking ovens, forcing Baldinger to build his ovens himself. The expert mason worked quickly and Fox completed his loaf first. Fox’s first bakery was on a water lot at the foot of 20th Street on the harbor behind where the Hendley Building is today. Unconducive to baking as well as patrons, he moved the bakery to 22nd, between Market and Postoffice, where business rapidly increased. In 1842, Fox purchased two lots on the corner of 21st and Mechanic where he erected a two-story frame building to house both the bakery and his family residence. A staunch Unionist and over the enlistment age, Fox did not fight during the civil war and temporarily closed the bakery. After the hostilities ended, he brought his sons, George and Christopher, into the business. When assured they mastered the trade, he transferred the bakery to them in 1869. Operating under the name G&C Steam Bakery, George and Christopher won several awards at the 1871 Texas State Fair, including best crackers made in Texas, best bread and best rye bread, best soda biscuit and best butter crackers. 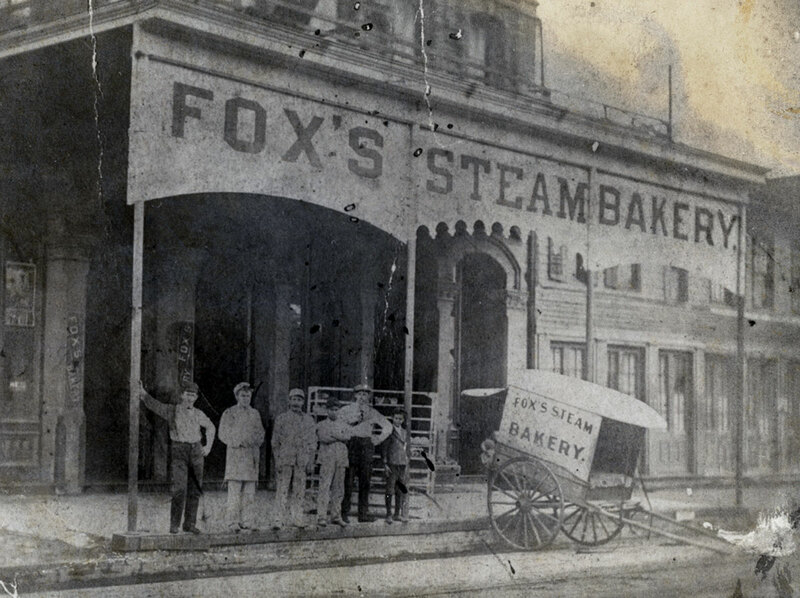 In 1872, the brothers opened a second location, Fox’s Steam Bakery, on the corner of 12th and Mechanic. Christopher Fox, Sr. died the following year on March 1, 1873. Galvestonians knew him as a straight forward man, friendly to those he knew and gruff to those his disliked, but well respected in the community.